Have just come in, 4.30 and rather tired after all the walking and riding today over this great place - it is a sight to see the people crowding in to the Hotel this afternoon and passengers luggage enough to frighten you - the large Halls are crammed with it - if I had not been accustomed to Hotels it would have taken the breath out of me to see the Coffee room last night and should think there would be many more tonight. I have got a splendid bedroom and slept very comfortably last night - had a call here last evening from our representative who resides in Liverpool - a gentlemanly young fellow called Edwards - they advised him from the office of my being here. Today after a visit to our office in Stanley St. (and sample room) Mr Edwards gave me the day and we have been on the tram car down by the docks and we just got a sight of the Etruria as she came out of dock to go out in deep water to another part of the river - have not been on board and do not intend to until tomorrow - at the Cunard ofﬁce this morning I saw among the printed list of the names of passengers Mr. Pollock - so am thinking it is the one I know - if so he has altered his mind as he intended going by the Allen line and had paid his fare. 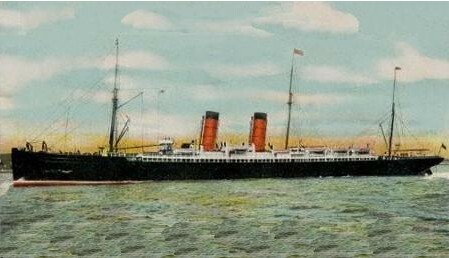 Have bought a chair and had my name painted on it - one of the young fellows in the Cunard office was very attentive and took me to a place to get one and will see it on board for me – he tells me my room is a large one and away from all the noise of the machinery. Dear Albert very kindly got 4 letters of introduction for me after I left him yesterday from Frank Whitwell from the ship's brokers in Bristol to their agents in New York and 3 other large places – thank God for having one brother in the ﬂesh that acted like one - it was a striking contrast to the conduct of another by whom I was not so courteously treated - Mr. Edwards took me to a respectable bankers this morning where I got some American money at the rate of a fraction over 3/2 - Liverpool is a ﬁne place, am very much impressed with it altogether - Just had a line from Arundel who has let the house - much love to you all and kisses for my darling Daisy.